Downtown Luxury Apartments. Both Modern and Timeless. Located in the heart of Downtown Saint Louis, you will find Gallery 720, a member of the Gallery Luxury Home Collection. Just minutes away from Culinaria Grocer, Busch Stadium, Ballpark Village, Enterprise Center, the lively Washington Avenue and much more! Live the lifestyle you deserve. Our Luxury Apartment Homes offer Chef Inspired Kitchens, State-of-the-Art Custom Lighting, Energy Efficient Stainless Steel Appliances, Deep Jetted Tubs, Spacious Walk-In Closets, In Unit High Efficiency Washer/Dryer, Gorgeous Counter Tops, and Much More! 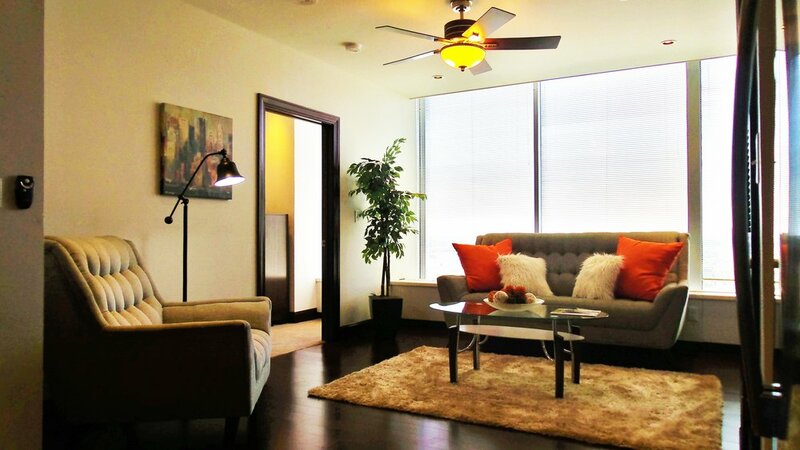 Our Studio Apartment Homes feature unique high-end finishes that you simply won’t find anywhere else. Exposed Honey Comb Ceilings, Gorgeous Quarts Counter Tops, Ultra Modern Apron-Front Sink, Custom Modern Cappuccino Cabinetry, Alcove Stand Alone Showers, Polished Concrete and Custom Tile Flooring. *Utilities Included: Water, Sewer, Trash and Electric. Residents are only responsible for Internet/ Cable. Parking Options Available starting at $115 per-month. 1 Bedroom, 1 Bath, 691 sq. ft.
1 Bedroom, 1 Bath, 800 sq. ft.
1 Bedroom, 1 Bath, 871 sq. ft.
1 Bedroom, 1.5 Bath, 915 sq. ft.
1 Bedroom, 1 Bath, 915 sq. ft.
1 Bathroom, 1 Bath, 921 sq. ft.
1 Bedroom, 1 Bath, 989 sq. ft.
1 Bedroom, 1.5 Bath 1,205 sq. ft.
1 Bedroom, 1 Bath, 1,240 sq. ft.
2 Bedroom, 2 Bath, 1,442 sq. ft.
1 Bedroom, 1.5 Bath, 691 sq. ft.
1 Bedroom, 1.5 Bath, 773 sq. ft.
2 Bedroom, 2 Bath, 1,432 sq. ft.
2 Bedroom, 2 Bath, 1,443 sq. ft.
2 Bedroom, 2.5 Bath, 1,470 sq. ft.
1 Bedroom, 1.5 Baths, 1,220 sq. ft.
1 Bedroom, 2 Baths, 1,632 sq. ft.
2 Bedroom, 2.5 Baths, 1,640 sq. ft.
3 Bedroom, 2.5 Baths, 2,940 sq. ft.
3 Bedrooms, 2.5 Baths, 2,582 sq. ft.
3 Bedroom, 2.5 Baths, 2,926 sq. ft.
3 Bedroom, 2.5 Baths, 3,191 sq. ft.